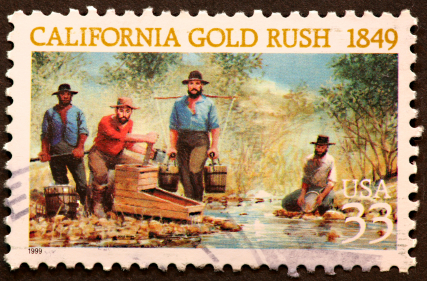 The California Gold Rush was 1st discovered in January of 1848 by James Wilson Marshall while he was busy constructing his saw mill along the present day American River near the northeast of Sacramento. This discovering was immediately printed on a variety of local newspapers intended for civilians to notice how amazing and beneficial this discovery truly was. At first this wasnt necessarily catching the attention everyone thought it would get due to unbelief of James Wilson actually finding gold along the river. It wasn’t until 1849 that a storekeeper in Sutter’s Creek showed off his bottle filled to the brim with gold, real life proof that soon spread like wildfire along all the territories and states of America. As soon as everyone noticed it was actually true this started the beginning of the flood of settlers coming from all over the colonies to the American River which later helped bring enough people to qualify for California statehood in 1850. An impact that rose due to this Gold Rush was the major Abolitionist movement due to the fact that now there’s proven ways to get rich and get wealthy without the need of slavery. California became an actual state, so now there was a decision to be made of whether California was going to be a free or a slave state. During that time the Compromise of 1850 changed the Missouri Compromise and let the Mexican cession territories decide weather or not it would be free or slave state but it did add California as a free state. This created an imbalance between free and slave states which helped lead to the civil war a decade later.